Tampa-based college Ultimate Medical Academy (UMA), whose co-CEO was the chief operating officer of controversial Trump University, has emailed its employees regarding an article that Republic Report published earlier this week. 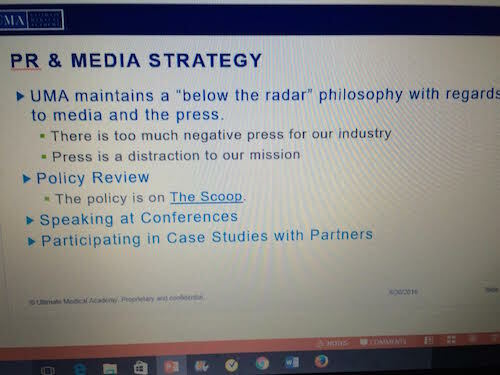 UMA CEO Steven Kemler wrote to his staff (see images below) that Republic Report‘s article “presented an unbalanced perspective about UMA” and directed all employees to “please refer any media or other external inquiries” to an email address for a company spokesperson. 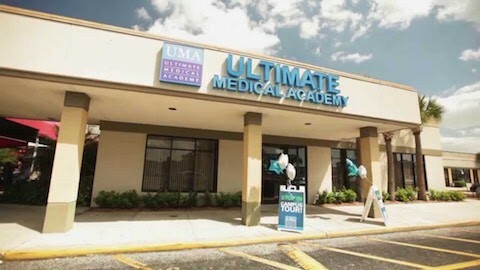 As we reported on Monday, Ultimate Medical Academy’s co-CEO, David Highbloom, was the chief operating officer of Trump University, while April Neumann, UMA’s vice president for corporate alliance & career services, was Trump University’s director of operations. Another UMA vice president was an intern with “the Trump organization,” and at least one former UMA employee also previously worked for Trump U., which has been sued for fraud by former students and New York’s attorney general. You are specifically prohibited from speaking with any journalist, reporter, author, blogger, newspaper, or media outlet with regards to Trump University, Trump Organization or Mr. Trump…. UNDER NO CIRCUMSTANCES SHOULD A TRUMP UNIVERSITY TEAM MEMBER EVER SPEAK TO THE MEDIA OTHER THAN TO INFORM THEM OF THE APPROPRIATE CONTACT AT THE CORPORATE OFFICE…. Immediately email Josef Katz media information including name, media affiliation and phone number, and cc April Neumann and Michael Sexton…. No matter how much confidence you have in Trump University, you should not say anything…. Reporters are rarely on your side and they are not sympathetic…. If a problem arises, immediately contact April Neumann. As I reported Monday, UMA, which offers programs in medical assisting, medical office assisting, and related fields and has been getting more than $150 million annually in taxpayer-funded student grants and loans, has faced numerous student and staff complaints about its recruiting practices. I also noted that UMA was a for-profit company but had recently been acquired by a new non-profit organization, in a transaction, whose key details remain undisclosed, that involved the largest owners of the for-profit company temporarily taking control of the non-profit and transferring some payments to the for-profit. UMA has 13,000 students, approximately 90 percent of whom train for medical careers exclusively online, with the rest studying at campuses in Clearwater and Tampa, Florida. 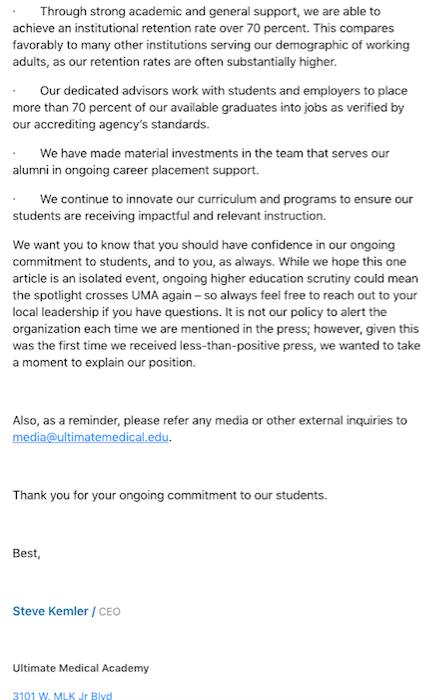 Since we published our article on Monday, several former UMA employees have contacted me to discuss their experiences at UMA; for now I will say only that they have a different view of the institution than Kemler. Former staff from outside lead generation companies also talked with me about selling UMA programs over the phone to students who had provided their contact information to bait and switch websites that promised jobs, rather than slots in career colleges. According to the Department of Education’s College Scorecard tool, just 42% of UMA’s former students earn more than a high school graduate. Graduates of UMA, which generally offers lower tuition prices than some comparable for-profit colleges, still end up with an average of $13,224 in federal student loan debt. 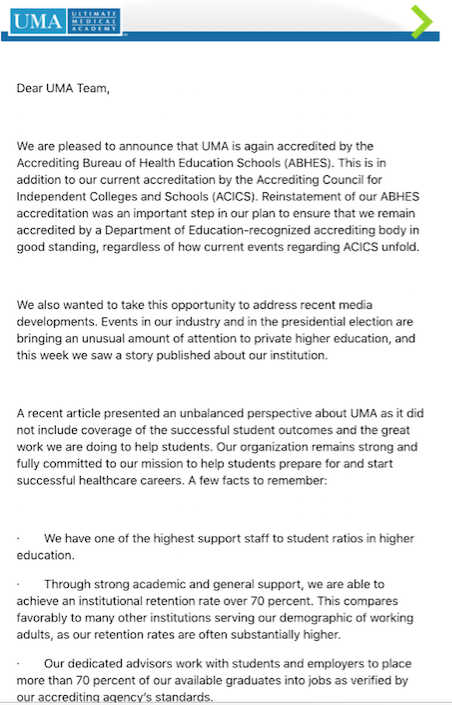 Kemler’s email to staff also announces that UMA “is again accredited” by the Accrediting Bureau of Health Education Schools (ABHES) in addition to the troubled Accrediting Council for Independent Colleges and Schools (ACICS). This month, both the staff of the U.S. Department of Education and a Department advisory committee have recommended that ACICS have its recognition revoked because of its lax oversight of predatory colleges. UMA may therefore have dodged a bullet on accreditation, and might also have found a way around another federal requirement for continuing to receive taxpayer dollars. UMA is on a list, compiled by the U.S. Department of Education, of schools that come close to 90% of their revenue from federal money when Department of Defense and Department of Veterans Affairs student aid is added to Department of Education aid; that total was 89.4% for fiscal year 2011-12. About 500 U.S. veterans are currently enrolled at UMA using G.I. Bill dollars. Under a provision of current law called the 90-10 rule, schools that get more than 90 percent of their revenue from Department of Education aid only can lose eligibility; DoD and VA money somehow counts as non-federal. UMA reported its federal aid take — Education Department money only — as 87.01 percent for 2013-14. However, 27 Senators have joined a bill that would start counting DoD and VA money as federal. If that happened, UMA could be perilously close to violation. But several years after converting from for-profit to non-profit status, as UMA has done, colleges are no longer subject to this 90-10 requirement.